That portable backyard pool is there for one reason – FUN! Flippin’ FROG keeps it that way with its patented minerals and a low dose of chlorine in an easy-to-use, easy-on-the-pocket, dual cartridge system. Best of all, it flips over when the chlorine is empty and needs to be replaced. 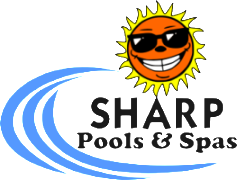 For pools 12-18 feet in diameter or 2,000 to 5,000 gallons. Most pool owners haul heavy chlorine buckets to the pool side and dump chlorine into their pool or skimmer on a daily basis. That’s a lot of hassle and those costs add up quickly. 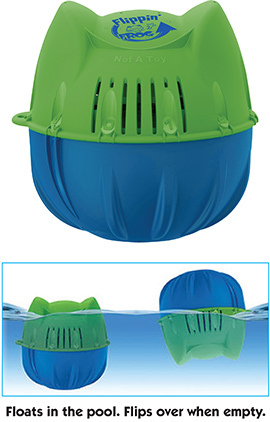 Flippin’ FROG operates at only .5 parts per million of chlorine compared to 1-3 parts per million for most pools so you’ll spend less on chlorine and experience soft, silky water all summer. Why should I use Flippin’ FROG? If you have a 12 to 18 foot pool, this is the easiest way to keep it clean and clear. What’s different about Flippin’ FROG? It is not just a floater. It uses minerals to destroy bacteria so chlorine can be reduced to much lower levels. The result is soft water without bleached swimsuits or smelly odors. How long does the green mineral cartridge last? 6 months or one pool season whichever is shorter. How long does the blue chlorine cartridge last? 3-4 weeks. Replace when Flippin’ FROG flips over.